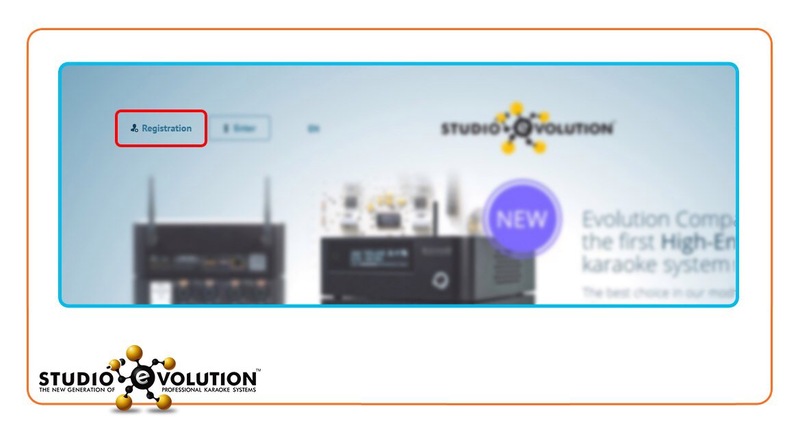 You can download song catalogues in your Personal Account or by sending a request to update@studio-evolution.com, indicating the serial number of your karaoke system. To download catalogues in your Personal Account, please do the following steps: - Enter your Personal Account using your login and password. - Select the Karaoke Systems section in the menu. - Select the karaoke system for which you want to download the catalogue. - Select the desired catalogue in the catalogue table and download it. The Studio Evolution company offers you song catalogues with monthly updates, as well as full catalogues available in .xls table. “Evolution Lite2” has built-in Wi-Fi module. Therefore you have two ways to connect Internet, using Wi-Fi module or wire connection. Follow our guidelines to set up Internet on “Evolution Lite2”: ● Open settings of karaoke system. ● Choose section “Network” Wire connection. Note: Company Studio Evolution recommends this connection type. Automatic Internet access’s settings (DHCP) is used by default on the karaoke system. You should choose “Type: Use statiс IP-address” for manual Internet connection. Further choose “Settings” and specify Internet options manually. Wi-Fi connection. Wi-Fi adapter is used in two modes: “Access point” and “Client”. “Access point” allows creating an autonomic access point of Wi-Fi network from the karaoke system. You may use this access point to connect your tablet for further karaoke system’s control. To create access point: - Choose mode “Access point” in the modal window. - Enter network name and password, consisting to a minimum of 8 symbols. - Save entries. - Connect to your Wi-Fi network with user-entered password using your tablet. “Client” allows you to connect your karaoke system to existing wireless networks. To connect to existing Wi-Fi network: - Choose mode “Client” in the modal window. - Choose an existing Wi-Fi network from a list. - Click OK on the remote control and connect. Karaoke system use automatic network’s settings after connection. If you need to set up manual configurations for this Wi-Fi network, you should: - Click OK the Wi-Fi network connection that you want to configure on the remote control and choose “Settings”. - Change the connection type from “Obtain an IP-address automatically (DHCP)” to “Use a static IP-address”. - Specify all the settings manually: IP-address, subnet mask, default gateway, DNS1, DNS2. If you want to update song database for karaoke system “Evolution Lite2”, you should buy update package of song database. Contact our company agent in your area for this purpose. You can update the karaoke system “Evolution Lite2” only online. Note: You can update song database only after the sign up on our Website. To set up acquired updating, you should get in the settings of the karaoke system, open section “Update” and choose subsection “Song base”. Click OK on selected update. You can install update with media (original video) or karaoke songs only. You can also install media later. Choose necessary item and click OK on the remote control. Guidelines for unregistered users. ● Register on Website www.studio-evolution.com as a karaoke system user. ● Complete the karaoke system information. 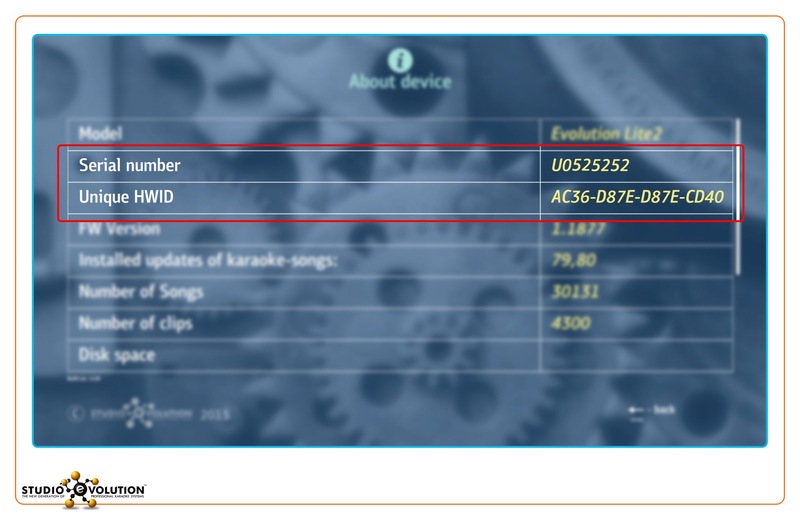 Note: If you need information about karaoke system's serial number and HWID, you can find it in the section «Device information». Guidelines for registered users. ● Sign in on our website with your username and password. ● Click “Add the karaoke system” in the section “User karaoke systems”. ● Complete the karaoke system information. There is no possibility to update unregistered karaoke system. Moreover, the registration on our Website gives you the following opportunities: - To review and download the karaoke songs’ catalogue. - To overlook the device’s technical information. - To order new songs. Is it possible to purchase only one song within the update package? You can buy a song only with the update package. Is there a possibility of audio output through HDMI connector? There is only a possibility of audio output via RCA connector on the karaoke system “Evolution Lite2”. The audio output via HDMI connector is impossible. You can download song catalogues in your Personal Account. To download catalogues in your Personal Account, please do the following steps: - Enter your Personal Account using your login and password. - Select the Karaoke Systems section in the menu. - Select the karaoke system for which you want to download the catalogue. - Select the desired catalogue in the catalogue table and download it. The Studio Evolution company offers you song catalogues with monthly updates, as well as full catalogues available in .xls table. The “Studio Evolution” company recommends the following models: Microsoft LifeCam Studio, Logitech c920, Logitech c615. Note: You can purchase Full HD WebCam of Microsoft LifeCam Studio by our area company agent. What is Demo Mode? How to remove the demo mode? “Demo Mode” is a limited mode of the karaoke system, in which songs are playing only over 45 seconds’. It is provided for karaoke system with limited license (bought by installments). You need to renew license to remove this limitation, contacting our company agent. Can I request a song to be included in the Studio Evolution karaoke database, and how to do this? You can place a request for a song to be included in an update, through you’re my Account area. For this purpose, open the “Catalogue” tab in your account and select “Send a request”. One request may contain up to 5 songs. How can I update the karaoke system? when buying an update, enter your e-mail. open the corresponding mailbox and download the update to your computer. save the downloaded update to a removable USB storage device. connect the USB storage device to the karaoke system and install the update. For «Evolution Home HD» Karaoke Media Center it is possible to install an update both in offline and online modes. «Evolution Home HD» updateinstallation. The «Evolution Pro2» karaoke system envisages only online update installation «Evolution PRO2» update installation. For detailed information on «Evolution Home HD» and «Evolution Pro2» updating, watch the «Updating» video tutorial. Why do the updates contain the songs that are already available in the song database? A song is duplicated only in cases when it is made in the PRO format, while the song database already contains this song in the LITE format. How much is it to update a karaoke system? The cost of a karaoke system update depends on the update pack you choose. You can familiarize with update packs in the “Catalogue” section. The payment can be made in My Account area. How to register in My Account Area? Enter the My Account page. Enter your e-mail and any password. If you are a karaoke system owner, fill in the data on your karaoke system. After successful registration, you can enter your My Account Area using your login (e-mail) and password. Which karaoke systems support control via iPad? «Evolution Home HD» karaoke media center supports control via iPad. The «Evolution PRO2» karaoke system gives a possibility to connect electronic catalogues via iPad and Android-based pads: the «EvoClub» feature. How to update the «Evolution Pro 2" karaoke system? To update the database of songs for a karaoke system «Evolution Pro2» and you need to buy a pack of songs database. To do this, contact the company's representative in your area, or make a payment on the Dashboard. For karaoke system «Evolution Pro2» update is installed only online Installing on «Evolution PRO2». see video tutorial "Update" For detailed information on updating «Evolution Home HD» and «Evolution Pro2». How to install on the karaoke system «Evolution PRO 2" new update database of songs or software? Set on «Evolution PRO 2" new update database of songs or updated software can be configured online karaoke system. Make sure that the karaoke system connected to the Internet - the network indicator should be blue. Click "Menu", select "Settings" and then click the "Update" tab. In the block "Software Update", information about the current version of your program. click "Check for Updates" to update the software. If the test server will be a more recent version of the software, the karaoke system will prompt you to install it. 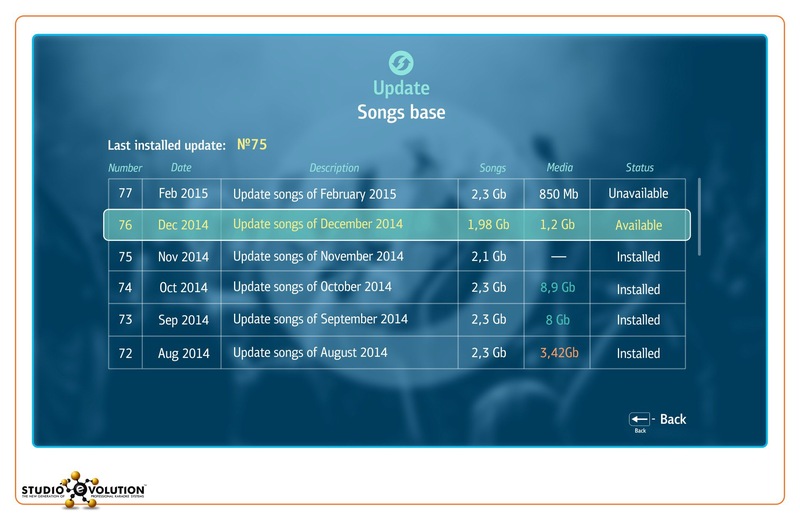 In the block "Updating database of songs" displays information about the available update for your songs database. To install the update, select the row with the update that interest you and start downloading it by double clicking LMB. More detail is shown in video tutorial. How much is it to update the “Evolution Pro2” karaoke system? The cost of karaoke systems updating depends on the update pack you choose See the «Catalogue» section to familiarize with the update packs. How to register «Evolution PRO 2" karaoke system? Sign up for a Personal Account "user karaoke system" by entering the information on the karaoke system. If you register for the second karaoke system, in the "My karaoke system", click "Add a karaoke system." How to register in the Personal Area (step by step instructions)? Go to the page of the Personal Cabinet. Enter your e-mail and create a password, repeat the password, then type the letters shown in the image to be scanned. To complete registration, follow the link that came by e-mail, which you specified earlier. Fill in the information about yourself. If you are the owner of a karaoke system, complete the information on the karaoke system. After successful registration, you can go to My Account under your login (e-mail) and password. Do we have to pay the copyright fee if we use your karaoke system at the club? Any club using any audio/video playback equipment shall, in accordance with the laws of the Russian Federation, enter into an agreement with the Russian Authors’ Society (RAO), in order to be entitled to use the equipment for commercial purposes through public performance of compositions. The Russian Authors’ Society is a state-accredited organization representing the interests of both Russian and foreign rightholders. What is a "Demo Mode"? "Demo Mode" - demo mode karaoke system, during which the karaoke song played only 45 seconds. Intended for karaoke systems with a limited license (purchased in installments). To exit the "demo mode" need to renew your license, contact the company's representative. How do I add «Evolution PRO 2" background music, videos and photos? Adding files to the «Evolution PRO2» by using the file manager. To do this, click the "Menu" and select "File Manager". The left and the right window displays the root directory and removable drives when they are connected to the karaoke system. As well as working with the file manager you can see in the video tutorial. How to set the club logo in the «Evolution PRO2»? size - for a square shape: height 124 px (static value) in width - 124 px; for rectangular shape: height 75 px (static value), the width - to 312 px .If the file will have other options, it will not open. Adding a logo in the «Evolution PRO2» by means of "administration". To do this, click the "Menu" and select the "Administration" section. Connect to a karaoke system, a removable USB flash drive that contains the logo file. select the shape (rectangle or square) In the "Club Info" tab, to which more close as your logo and click "Open". Save your changes. If you do not want to appear on the screen of the club logo, select "Do not print the logo on the guest screen." As you can see on this issue video tutorial . "Administration" What is the profile? Disable the launch of karaoke songs. Close access to the "black list". Close access to the equalizer. Close access to the settings of the karaoke system.Also allows users to create a karaoke system and to separate them by type: administrator, Sound, backing vocalist. The accounting system statistics karaoke system will store user names for each running a karaoke song. How to add a song to the "black list"? Add a song or artist in the "Black List", you can use the context menu of the block caused by the PCM find songs, queue and favorites. To remove a song from the "black list" go to "Settings" karaoke system «Evolution PRO2», tab in the "black list" and click LMB on the "Delete" button next to the desired song. Clear all the "black list", you can press the "Clear" button. How to write a guest appearance? To record the performances you need to select a song, click "Record" and start playing a karaoke song. To stop recording, stop the playback of the song. As you can see on this issue video tutorial . What audio and video output interfaces are available in a karaoke system? Video: -Analogovye: VGA, Composite (via VGA EVC15 signal converter). Digital: DVI, HDMI. Audio: Inputs: 2 balanced or not balanced TRS 6.3mm. Yield: 2 balanced or not balanced TRS 6.3mm. How to connect and configure the screens? Guest screens and karaoke system must be connected to a single phase power supply and be grounded on a common bus. Karaoke system must be connected via an uninterrupted power supply with an isolation transformer. Connect the guest screen housing and a karaoke system by the electric wire. We recommend using the services of professionals. To make a connection to the screens «Evolution PRO2» can only be switched off equipment. Connect the guest screen and the monitor engineer to «Evolution PRO2» for HDMI, DVI, VGA, or Composite (via VGA EVC15 signal converter). Turn karaoke system «Evolution PRO2». Go to Settings karaoke system ( "Menu" - "Settings"). Open «screens" tab. Click on any signal connected to the monitor engineer. If more than one guest screens with different resolutions via Composite (VGA signal converter EVC15), then in the settings «Evolution PRO2» need to specify the screen resolution of 1024 * 768 and select the basic setting "Automatic adjustment of titles." To change the image size on the screen of a guest, click the «size» in the converter EVC15. Disable the karaoke system, and turn off one of the monitors. After that, turn on the karaoke system with one monitor and configured to select the correct resolution for this monitor. Use hot keys reset screen settings: L_SHIFT + L_ALT + L_CTRL + R. Then a karaoke system will reboot automatically and configure the monitors need to produce again. Karaoke system «Evolution Pro2» supports the management with the tablet? Karaoke system « Evolution PRO2 » has the ability to connect electronic catalogs to the iPad and tablets based on Android - option « EvoClub ». What is «EvoClub» and how does it work? «EvoClub» - is an electronic catalog of songs with the possibility of sending the order to producers, as well as an internal chat between guests of the club through a Wi-Fi network. A detailed description of this feature can be found on our website on the page EvoClub and how to work with it - in instructions «Evolution PRO2 » and video tutorial . For «EvoClub» we recommend using the following plates: for iOS: iPad2, iPad3, iPad4, iPad Air, iPad Mini, and the software version is not lower than iOS 6.0. for Android: The minimum specifications for the tablet on Android: capacitive screen - 7 or 10.1 inch, RAM - at least 1 GB, dual-core processor at 1 GHz or higher, OS Android 4.1 and above. How to configure your network to work with «Evo Club»? 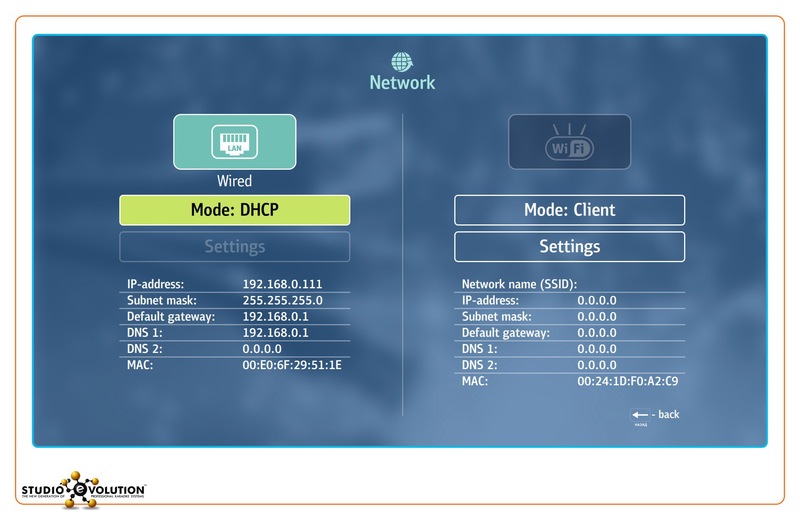 Open the settings «Evolution PRO 2" ("Menu" - "Settings") and in the "Network" tab, select "Use Static IP-address", and then select the correct settings on your local network. To connect the «Evo Club karaoke system,« Evo Club settings "you must specify the correct address of the IP-karaoke system that you specified in the settings of the karaoke system« Evolution PRO2 ». Plates with «Evo Club» must be in the same local area network with a karaoke system. What kind of pads do you recommend for “EvoClub”? For “EvoClubAdmin” Series, only iPad should be used. For iOS: iPad2, iPad3, iPad4, iPad Air, iPad Mini, and software versions not lower than iOS 6.0. For Android: minimum technical requirements for other Android-based pads: 7” or 10.1” capacitive display, at least 1 Gb RAM, Dual Core Processor of 1 GHz and higher, OS Android 4.1 and higher. Where can I download applications for a pad? iOS - «EvoClub Admin» series, «EvoClub Guest» series. Android - «EvoClub Guest» series. What is the program «Trade-In» by «Studio Evolution»? Promotional program «Trade-In» from the company «Studio Evolution», held in connection with the release of a new karaoke systems «Evolution Pro2». Its conditions can be found on the page « Trade-In ». I am the owner of a karaoke system «Evolution Pro» / «Evolution Lite». How much will it cost me to buy «Evolution Pro2» under the program «Trade-In»? Conditions value exchange described in detail on page «Trade-In». How to make disaster recovery? Switch off all graphic data output devices (TV, projectors, monitors). Connect one main monitor to display the recovery system interface. For example: if two display devices (TV and monitor) are connected to the karaoke system video outputs: the VGA output (monitor) and the HDMI one (TV), the boot menu will be displayed on the TV connected to the HDMI output. Switch on the karaoke system using the power button on the front panel. Immediately after you see the first boot image, press and hold the left Shift key on the keyboard until the karaoke system boot selection menu is displayed. * If the boot menu is not displayed, you have to switch off and then to switch on the karaoke system again, and to repeat the procedure. After the boot menu is displayed, select Recovery System using the Down key on the keyboard, and confirm your choice by pressing Enter. Then, after the system recovery interface is booted, select Recover Data with the mouse cursor. After the karaoke system software recovery is finished, select Exit in the bottom left corner with your mouse cursor. The karaoke system will be rebooted. File system check – checks the file system of the karaoke system root partition for errors. *File system errors may be caused by improper shutdown of the karaoke system during its operation (e.g. power failure), or by the hard drive failure. Data recovery – recovers the karaoke system software to the factory-installed version. *After the software recovery, all settings and saved data (Favorites, Playlists, etc.) will be deleted. The song database, background music, background video, and slides will not be affected. After the data recovery, on condition that the karaoke system is successfully booted, it is necessary to check for a new software version (Menu –Settings – Update – Check software update), and to install it, if it is available. Connection to a remote server – this option serves for remote connection of the company’s technical support specialist to the karaoke system in case of emergency. To be remotely connected to the server, the karaoke system should be connected to the Internet. Obtaining an automatic IP address and DNS servers (by default). Setting up a static IP address and DNS servers. After making changes to the network connection settings, you have to confirm them by pressing the Accept button. After setting up the Internet connection, click Connect with the mouse cursor. Connection to the server will be accompanied by the message: ‘Connection to the server has been established’; if the connection fails, check whether the network connection settings are correct. Connection to the server should be done if the software cannot be started even after the data recovery. To enable the company’s specialist to remotely detect the cause of the failure, please contact the technical support beforehand, using the contacts listed on the company’s website: www.studio-evolution.com. What are the working conditions of the karaoke system with an unlimited license (hire purchase)? For karaoke systems purchased with a limited license, it is imperative to connect the karaoke system to the Internet. «Evolution PRO2» have to be connected to the Internet each time you start, otherwise the system will work in « Demo mode ». To exit the Demo Mode, you have to connect the karaoke system to the Internet. At each start of the karaoke system with a limited license, the number of days before the license expiry will be displayed. To renew the license, you have to pay for its further use. After the expiry of the limited license, the karaoke system goes into the Demo Mode. How can I update the "Evolution Home HD" karaoke system? 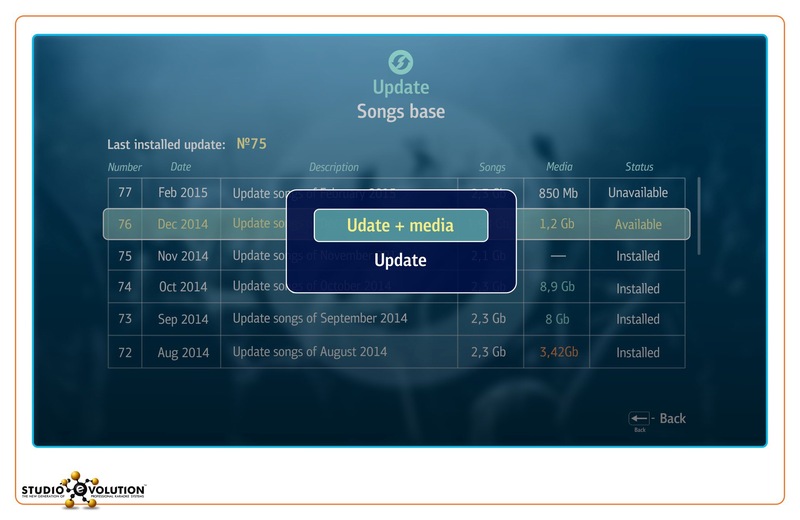 To update the song database for the «Evolution Home HD» karaoke system, you should buy a song database update pack. To do this, please contact the Company’s representative in your region or make payment in the My Account Area. For «Evolution Home HD» Karaoke Media Center, it is possible to install an update both in offline and online modes. «Evolution Home HD» update installation. For detailed information on «Evolution Home HD» updating, watch the «Updating» video tutorial. How to install a song database update on “Evolution Home HD”? Enter the Media Center menu (by pressing the Menu button on the Small Remote Control) and select “Update”. The updating system operates both in online (continuous Internet connection is required) and offline mode (a service flash memory card containing the necessary update should be available). When the service USB storage device is connected to the Karaoke Media Center, the program will try to find an update on it. If you wish to install an update in online mode, unplug the service USB storage device from the system and restart the updating program. This procedure is also described in the video tutorial. What is the cost to upgrade the karaoke system «Evolution Home HD»? The cost of renovation of karaoke systems depends on your service pack. To view the update packages in the section « catalog ». How to install the cover and the background music for the intro? To install the cover and background wallpaper for the music you need to connect «Evolution Home HD» Internet. Their installation takes place at adding music to your library. How to add music, movie, video, and photos in the «Evolution Home HD»?
. The file manager is divided into two windows. By default, the left displays the files and directories that are on the USB-drive and right - files and directories that are at the root of «Evolution Home HD». Add files to the appropriate directory «Evolution Home HD»: music - the catalog «Music», video - in the «Video» directory, films - to the catalog «Films1 (Disk1)» or «Films2 (Disk2)», a photo - into the directory " Pictures ». If you want to copy several directories or files, then use the key to highlight the "Pause" on the Small remote control. Open "Run". To do this, press the keyboard shortcut Win + R.
Navigate to the directory "media". Open the Finder file manager. In the toolbar, select «transition». Select the item "Connect to Server ...». In the "Server Address", enter the «smb: // Karaoke» and click "Connect» . In the "Music" / "Movies", press the "down arrow" on the Small remote control and select the item "Files». Whether «Evolution Home HD» Supports control of the tablet? «Evolution Home HD» supports the management with the iPad. To manage karaoke media center with the iPad, it ustanovoite application « EvoHomeHD ». On 07/16/2014 the application has become free. Description of the controls with the iPad karaoke media center «Evolution Home HD» can be found in «Evolution HomeHD instructions »and video tutorial . How can I update the “Evolution Pro” karaoke system? IMPORTANT! The “Evolution Pro” karaoke system will be serviced until December 31, 2015. Why are updates added when the songs already exist in the database? A song is “repeated” only in case it has been produced in PRO format when the database already contains this song in LITE. format. How much is it to update the “Evolution Pro” karaoke system? The cost of karaoke systems updating depends on the update pack you choose. See the «Catalogue» section to familiarize with the update packs. Support for the «Evolution Pro» Karaoke System How long will be made? Karaoke System "Evolution Pro" will be maintained until 31 December 2015.